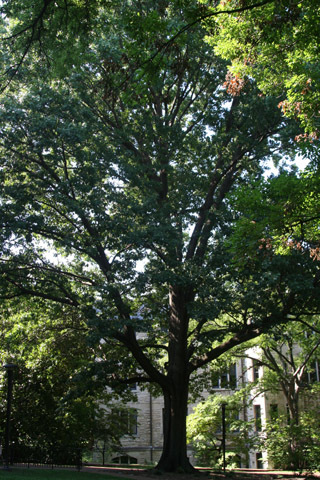 The largest Shumard oak in the arboretum is located between Furman and Calhoun Halls. It also has the distinction of being one of the largest oak individuals and is among the ten largest trees in the arboretum, with a very large diameter of 128 cm (50 in.) and one of the largest crown spreads of 28 m (92 ft.). With their pointed lobes, Shumard oaks are similar to other oaks in the red oak group. Unlike other species in that group, their twigs and acorns tend to have grayish wax on part of their surfaces. This organism is a living specimen that is part of the  Vanderbilt University Arboretum  with the local identifier 2-1021.